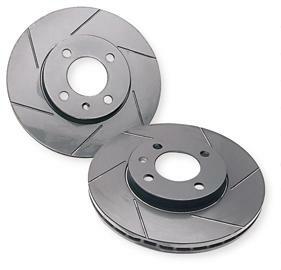 NEUSPEED Brake - Slotted Rotors - Lightning Motorsports - Selling Speed since 1996 ! NEUSPEED rotors are designed with a unidirectional pattern, therefore, each rotor kit consists of a left and right unit. After machining, all rotors are balanced to within one gram, and then black cadmium plated for rust protection and a show-quality appearance. The patented asymmetrical design is engineered to relieve hi-temp gas build-up between the pad and rotor under the hardest braking conditions without sacrificing the structural integrity of the rotor. The gas slots are CNC machined to a specific angle and length. With less heat build-up, your pads and rotors will last longer and will be less likely to fade when you truly get on the brakes. The NEUSPEED slotted rotors are perfect for your street and racing applications.